The Idea Gallery section contains resource articles on how you can use VWO to optimize your website conversions across the industry. Use this section to read various examples of how to use VWO to modify different elements of your websites and increase your sales. The articles in the section also discuss the best practices for implementing your conversion optimization strategies. Depending on your preference and requirements, you can filter resources by difficulty level, implementation time required, elements to test, and so on. This section contains a comprehensive list of case studies and success stories of VWO implementation across industry verticals. You can browse for case studies developed by VWO team on businesses from across the industry. Our case studies discuss the challenges, goals, and how different organizations successfully implemented their website testing strategies using VWO. These study papers analyze how different organizations used VWO to implemented changes to their websites and yielded positive results. This section contains general resources and reference articles relating to A/B testing and conversion optimization. 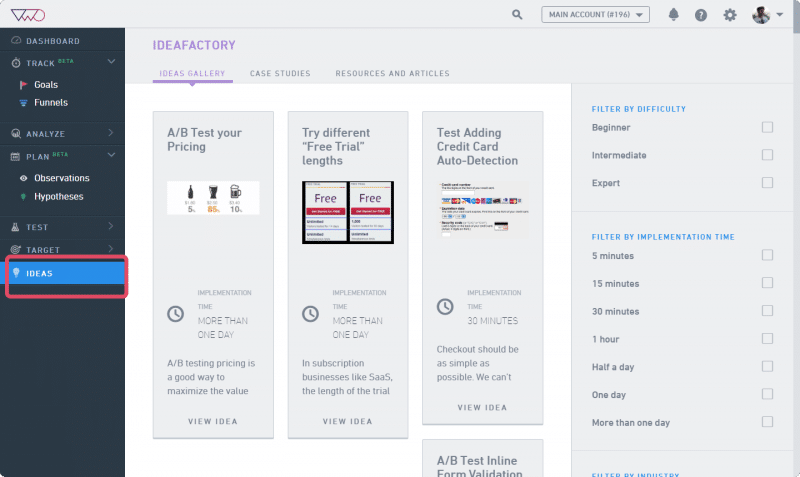 The articles in this section provide you deep insight into the latest industry trends in A/B testing, and different businesses use it to improve their website conversion rate. Use the search bar to find articles based on keywords. To filter resources by industry, select the relevant industry types on the left pane, under Filter by Industry. To filter resources by elements tested, select the relevant element type on the left pane, under Filter by Element Tested.